What Do You Mean, the Beach is Closed? While we can’t control everything that goes into the lake, we can work together to prevent water pollution by being conscientious about proper disposal of chemicals and pet waste. Last month, on a sweltering day in July, I decided to seek relief at our town lake. I gathered my things and drove to the beach, eager to jump into the cool water, only to be told by the lifeguard that the swimming area was closed due to a high bacteria count – and it was the fifth day in a row! Although the water looked beautiful and pristine from a distance, the area had become a feeding ground for geese, and the resulting goose poop had contaminated the water. 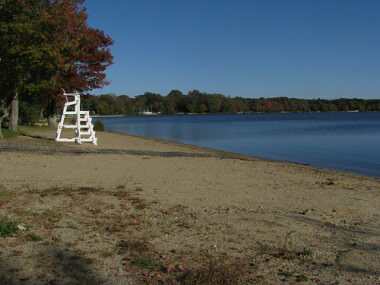 Fortunately, the Sharon Board of Health tests the lake water twice a week, and they were able to close the beach until the bacteria dissipated. Storm drains discharge dirty water to streams, ponds and wetlands. Unfortunately, goose poop is only one of the contaminants that can affect the health of our waterways. Household chemicals, lawn fertilizers, pesticides, motor oil, and dog poop are also major contributors to water pollution. While we can’t control everything that goes into the lake, we can work together to prevent water pollution by being conscientious about proper disposal of pet waste and chemicals. The town is aware of the goose problem and is working to eliminate the issue, but the beach could have just as easily been closed due to bacteria from dog waste left on the ground, or from excess runoff polluted with other contaminants. Seemingly little things, like picking up after a dog or sweeping up spilled fertilizer, might not appear to be a big deal, but the cumulative effect of these choices can make a big impact on the quality of the water around us. 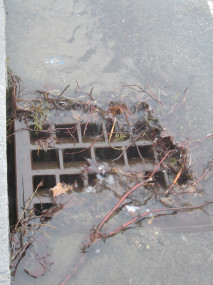 For more information on how to prevent stormwater runoff, please visit: www.sharonwater.com.